Good morning everyone, I hope you all had the Merriest of Christmas' yesterday. I'm online for a bit to tell you that this week is week 4 of the Stampotique Designers Challenge over at the blog. Although this is the last week you can enter again to win a 30.00 gift card for the Stampotique Originals Store. 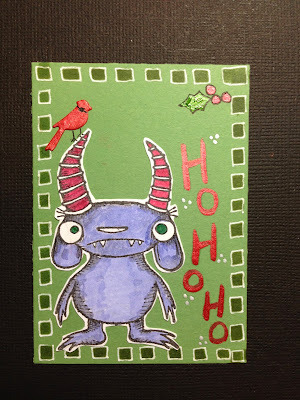 For the challenge this week, I made a festive ATC for the holidays. I colored my goat monster with colic markers and cut him out. I used stencils along the edges and then went around them all with a white pen. For the bird I used a die to cut him out and then colored him with Smooch ink. 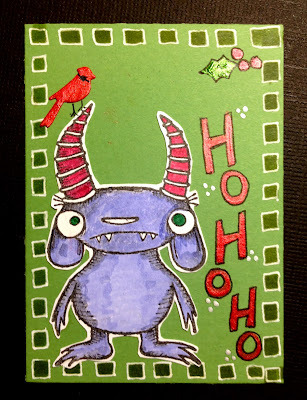 I also used smooch inks for the holly and the words Ho Ho Ho. I don't think that Goat Monster ever looked so good, Claudine, especially with those festive horns! Nice holiday ATC, my friend! awwwwwwwwwwwwwww don't you want to just hug him. Nicely done. Certainly has the awww factor.